too tightly or the axillary artery will be compressed, adversely affecting the circulation of the arm. Figure 323 shows the proper application of a cravat bandage for the axilla. BATTLE DRESSING A battle dressing is a combination compress and bandage in which a sterile gauze pad is fastened to a gauze, muslin, or adhesive bandage (fig. 324). Most Navy first aid kits contain both large and small battle dressings of this kind. RESCUE AND TRANSPORTATION LEARNING OBJECTIVE: I d e n t i f y protective equipment items that are used during patient rescues, and recall how and when each protective equipment item should be used. It is a basic principle of first aid that an injured person must be given essential treatment before being moved. However, it is impossible to treat an injured person who is in a position of immediate danger. If the victim is drowning, or if his life is endangered by fire, steam, electricity, poisonous or explosive gases, or other hazards, rescue must take place before first aid treatment can be given. The life of an injured person may well depend upon the manner in which rescue and transportation to a medical treatment facility are accomplished. Rescue operations must be accomplished quickly, but unnecessary haste is both futile and dangerous. After rescue and essential first aid treatment have been given, further transportation must be accomplished in a manner that will not aggravate the injuries. As a Corpsman, it may be your responsibility to directand be the primary rescuer inthese operations. The life and safety of the victim and the members of the rescue team may rest on your decisions. In this section, we will consider the use of common types of protective equipment; rescue procedures; special rescue situations; ways of moving 3-12 Figure 321.Cravat bandage for the elbow or knee. 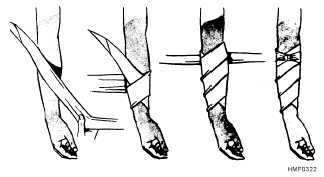 Figure 322.Cravat bandage for the arm, forearm, leg, or thigh. Figure 323.Cravat bandage for the axilla.